We’ve been making our Pipeless Radiators to the highest standards for many years, and here are some of the questions we get asked most often. If you still have a question call us on 01422 231943, email info@radiwarm.com, or use the form at the bottom of the page. How much does a Pipeless Radiator cost to run? The RadiWarm is 100% efficient so all the electrical energy that goes into it is converted to heat, making it one of the most efficient heating solutions on the market. The costs of running any heating system vary significantly based on how well your property is insulated, your electricity tariff and many different factors. However, on average the RadiWarm will heat up a 10m² room from ambient in about 15 minutes, using its self-contained patented boiler system to heat the water inside. Once a room reaches the desired temperature, the RadiWarm’s Smart Heating software will switch to eco-saving mode to maintain ambient room temperature – only needing to pull electricity approximately 50% of the time it is active. What medium does the radiator use? Our Pipeless Radiators are water-filled and heat your home just like a conventional plumbed central heating system. Radiators arrive ready to use, filled with specially treated water and fully sealed. They don’t require plumbing, flushing, bleeding or topping-up before, during or after installation. This ensures that the built-in patented boiler gives the same heat quality of a gas central heating system, but without plumbing, pipe work or even a gas supply. Where can a Pipeless Radiator be used? 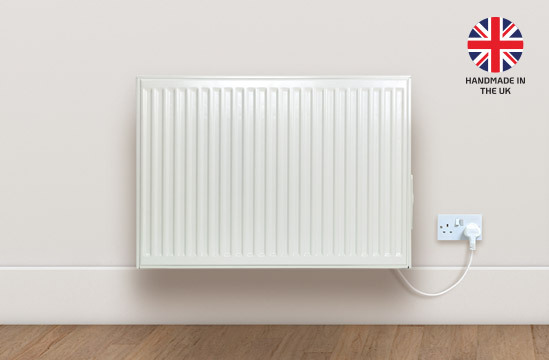 A Pipeless Radiator can be used anywhere that has a mains electricity supply. This makes it perfect for use throughout your property, including loft conversions, gardens rooms, living rooms, kitchens, bedrooms, offices, garages and even bathrooms (our radiators are IP44 rated enabling them to be used in bathroom applications provided they are installed in the correct zone – IP44 is applicable to Zone 2). If you’re looking to heat a conservatory, then there really isn’t a better option and we produce a special half-height version of the RadiWarm specifically for this use. 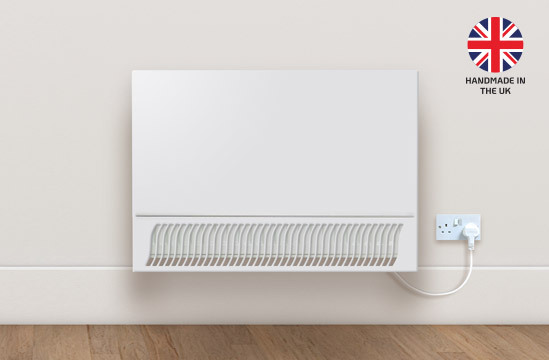 Many people also use a RadiWarm Pipeless Radiator to heat rooms that are on the ‘end’ of the heating system or may only require additional heat at certain times of the year. What is the difference between a water-filled Pipeless Radiator and oil-filled? Water-filled radiators heat up quickly and are more controllable than oil-filled versions. Oil hits a peak then drops rapidly again needing a lot of energy to reheat. Once a RadiWarm reaches the required room temperature, the Smart Heating software puts the radiator into eco-saving mode, only turning the in-built boiler on when it needs to top up the ambient temperature. How does a Pipeless Radiator compare to other heating options? Breathing dry air caused by typical electric heating systems can aggravate respiratory problems such as asthma and sinusitis. Our unique water-filled Pipeless Radiators provide both convection and radiant heat – which doesn’t dry out the air and provides the same good quality heat as a typical plumbed radiator system. On average the RadiWarm is also far more energy efficient than other heating systems. If you would like us to install the radiator when we deliver it, we offer full installation service for a nominal additional cost. If you want to install it yourself, our Pipeless Radiators are easy to mount to a wall – you don’t need to undertake any plumbing or electrical work; full instructions and brackets are supplied with each Pipeless Radiator. Yes we deliver free to most areas of the mainland UK. None. Our Pipeless Radiators are fully sealed and filled with specially treated water. The radiator doesn’t require plumbing, flushing, bleeding or topping-up. Does the radiator make a noise? Our radiators are very quiet. Initially, there may be a slight gurgle when the radiator is installed until the air settles and you may hear a quiet hum when the pump is working, but outside of that they are virtually silent. Our radiators are IP44 rated enabling them to be used in bathroom applications, provided they are installed in the correct zone. IP44 is applicable to Zone 2. What size radiator do I need to heat my room? Pipeless Radiators are available in 11 different widths and 3 different heights to give you the perfect sized Pipeless Radiator for your property (including our low-height models perfect for conservatories). Use our guide during checkout to buy the right sized RadiWarm for your room or view our size guide here. Can I replace my old storage heaters with your radiators? Yes, our water-filled radiators work best using Economy 10 or standard tariff, but your energy supplier will be able to help further. Where are the radiators made? We are proud to make all our RadiWarm Pipeless Radiators by hand in our modern purpose-built manufacturing facility nestled in the hills and valleys of Halifax, West Yorkshire. Halifax has a strong industrial heritage that we are very proud to continue. What colours do the radiators come in? All our Pipeless Radiators are made in white to match the look of a traditional radiator. All our Pipeless Radiators come with a 2 year guarantee as standard. Make sure that you complete your registration card online after installation. What do I do if I have a breakdown? In the very unlikely event that you have any problems with the radiator, then contact our office. We will ask you a couple of trouble shooting questions that normally fix 90% of problems. If we can’t resolve the issue over the phone, and your radiator is still under warranty, then we will send you a replacement. How does the Safe Touch differ from a standard radiator? The RadiWarm Safe Touch is the same pipeless radiator but includes a protective low-temperature cover. Pipeless Radiators have been a godsend for us. They are efficient, they heat up quickly and quietly, and they were very quick and easy to install. RadiWarm Pipeless Radiators saved our tenant over £350 in heating costs last year. I am delighted because whilst the radiators are a huge improvement on my old storage heaters, they also comply with my own environmental beliefs. Installing Pipeless Radiators throughout our home halved the cost of replacing our oil-fired system. Once they were all mounted on the wall all I had to do was plug them in. With over 20 years in the industry, the RadiWarm is the best heating system we have come across. Your customer service and communication levels certainly exceed any company I have ever dealt with. Once again, thank you. The Pipeless Radiators arrived yesterday afternoon. All four have been installed and are working well. We are exceptionally pleased that we have chosen RadiWarm. I would just like to say thank you for your company's very quick delivery of my mother's RadiWarm. Very impressed! It’s up and running now. Thanks again. I have never before come across a system that looks and performs like central heating and offers excellent conversion of input to output of energy. If you need permanent heating in a space where plumbing or a gas supply is not an option, the RadiWarm is the best and most efficient solution. Where you may have children or vulnerable adults, the RadiWarm Safe Touch gives the same quality of heat but with a protective low-temperature cover.